As walkers, we travel on the railways all the time and never give them a second thought. In this we have a lot in common with the Victorians who created the network we ride on today. Though railways were a technological wonder to them, they didn’t particularly like them and they certainly weren’t nostalgic about them (see The golden age of the railways). They regarded them as a practical way to get around, and if they gave them a thought at all, it was usually to complain about them. Moans about late, uncomfortable and overcrowded trains are nothing new – they are as old as the railways themselves. And yet as walkers we see another side to the railways from the one the commuter sees. Fast and frequent trains whisk us from central London to a wide range of rural locations, and the number of times that there significant delays to the trains are remarkably rare. The network takes us to such wonderful rural stations as Wadhurst, Southease, Pluckley or Hever, almost invariably with an hourly service that runs seven days a week, from early morning till late at night. But how did this network come to be created? And why is it the way it is? That is what these pages set out to answer. They describe how the railway started (Beginnings) and the amazing speed with which they were developed (From London Bridge to the sea and South East to Dover). They explain why there are two ways to get to Sevenoaks, Maidstone, Ashford, Canterbury and Dover (Bitter competition - and its benefits) while there is just one to get to Winchester or Southampton (A more rational railway). They reveal why trains from some places go into only one London terminus, while others go into two or more (Terminus wars), and why a ticket to Yalding is valid for return from Borough Green (Bitter competition). They answer such questions as why the trains on the Marlow branch reverse direction at Bourne End (Thames and Chilterns) and why minor delays on the Hastings line so easily escalate into major hold-ups (South East to Dover). They address that perplexing question of why the main departure boards at Victoria are divided into two sections, each with the trains in chronological order (Terminus wars). They also tell you the story behind some famous landmarks we pass on the walks – such as the Ouse Valley Viaduct (From London Bridge to the sea) and the beautiful viaduct near Eynsford (Bitter competition). They alert you to some interesting survivals from a former age, such as the tiled map of the London, Brighton & South Coast Railway in its heyday, which can be found in a passageway at Victoria station (Bitter competition: photos in Lines we lost and A miraculous survivor). These pages then explain why the south east kept many of its railway lines while other parts of the country lost theirs (The sparks effect, Lines we lost and A miraculous survivor), and they provide a corrective to that curious English nostalgia for the way the railways used to be (The golden age of the railways). 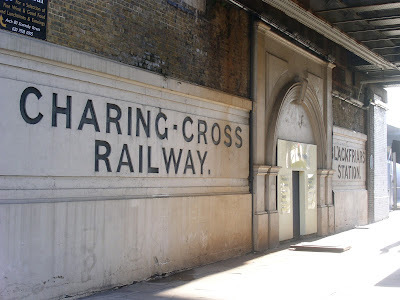 Lastly, a special feature looks at the forgotten world of London's late nineteeth century urban railways - London's Victorian railways. And another - The South East in 1960 - wonders what it might have been like to travel by train to a country walk in the pre-Beeching era. Hopefully, reading them will open your eyes and make the railways you travel on a bit more interesting. And then you can forget all about them and go back to taking them for granted – which is after all, what they are for.